Pro-Tec Advanced Skincare is powerful antibacterial barrier cream that prevents and treats many skin conditions ranging from simple irritation or diaper rash to minor skin breakdown. Its very high content of vitamin A helps moisturize the skin and can combat skin inflammation and redness. It contains the maximum concentration of Zinc Oxide allowed without a prescription to rapidly nourish damaged skin cells and provides a protective barrier to seal out wetness in the prevention of diaper rash. Pro Tec Advanced Skincare leaves skin soft and supple. Lanolin falls into the lipid-rich emollient class of moisturizers. One of the causes of dry skin is a lack of lipids, which allows water to escape. Lanolin fills in those gaps, preventing future water escape. Skin bio-engineering studies have shown that the durational skin smoothing effect produced by lanolin is imediate, very significant and lasts for many hours. Lanolin is very effective in soothing dry, irritated skin anywhere on your body including the scalp. Zinc oxide is an inorganic compond mineral widely used in topical ointments for many different skin irritants. 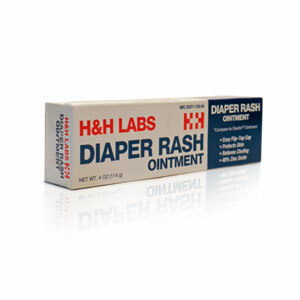 Its most common uses are for treating diaper rash, acne, severely chapped skin, and minor scrapes and burns. Zinc oxide is known to have minor astringent and antiseptic properties that make it a healing, protective barrier for the skin. It is the broadest spectrum UVA and UVB reflector that is approved for use as a sunscreen by the U.S. Food and Drug Administration (FDA) and is completely photostable.